That could spell trouble for some travellers, he says. Prime Minister Justin Trudeau addresses the Liberal Party National Caucus meeting in Saskatoon on Sept. 12, 2018. The federal government is giving "dangerous" advice to Canadians planning to cross the border after marijuana is legalized on Oct. 17, one lawyer says. 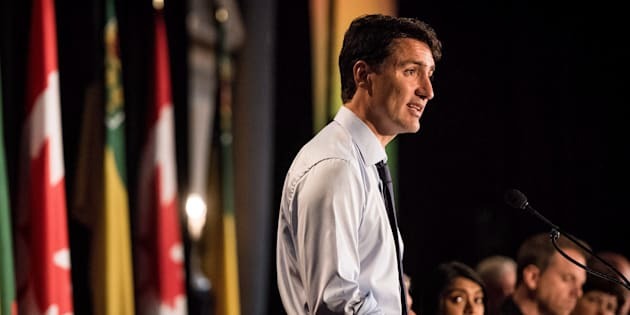 Len Saunders, a Blaine, Wa.-based attorney, told HuffPost Canada the government's messaging to Canadians so far has been to tell the truth if they're asked by a border guard whether they've used pot in the past. But admitting to pot use could lead to a lifetime ban from the U.S., Saunders said, as cannabis is still considered illegal federally. That risk remains even if a Canadian is crossing into a state where pot is legal, since borders are under federal jurisdiction. Saunders, who testified at a Senate committee in March on the government's cannabis legislation, said the government must warn Canadians about this risk as it approaches the "11th hour" ahead of legalization. "The advice that they're giving puts Canadians in a position to receive a lifetime bar, and they're not fully explaining that to Canadians," he said. "I think that's dangerous advice. I think it's inappropriate advice. They haven't thought it through." Saunders' advice for Canadians is to not answer the question if it's asked. "You can say 'I don't feel comfortable answering that question' and withdraw your application [to enter]," he said. That could still make an officer deny your entry, he added, but it can help avoid a lifetime ban. During an interview on CBC Manitoba's Information Radio on Tuesday, Prime Minister Justin Trudeau was asked how he would respond if a border guard asked him about his past marijuana use. Trudeau told HuffPost in 2013 that he smoked pot while he was an MP. "I've never lied to a border guard," Trudeau told CBC's Marcy Markusa, adding that the U.S. has the right to determine who gets to enter its borders. "I think choosing to partake in marijuana has consequences for individuals, for their lives in different ways, and we're not encouraging that, and that's certainly something that people will have to reflect on if they plan to travel to the United States." Saunders read Trudeau's response as being less direct than the messaging from ministers like Bill Blair and Ralph Goodale. He took it as a sign that the government realizes there's "a problem" and confusion over border issues. "They've had two years to investigate this, they've had two years to get an answer from the Americans." The PM's office told HuffPost that Trudeau maintains that Canadians should tell the truth at the border. Asked by CBC what he would to do protect Canadians when there's such a big difference in laws between the two countries, the PM said: "Well, it's not that different. If you're travelling from B.C. to Washington, both sides will have legalized marijuana as of Oct. 17." Saunders said he took this as a "strange" comment from the PM, though Trudeau's office clarified he meant that even though B.C. and Washington State will both have legalized marijuana, the drug itself is still a controlled substance federally. Saunders said the Liberals need to press their U.S. counterparts for more information on what will happen to Canadians crossing the border who admit to marijuana use or those who work in the legal cannabis industry. Canadian government officials have discussed the changes to the country's cannabis laws with the U.S. in "virtually every conversation" they've had with counterparts, said Stevie O'Brien, chief of staff to Border Security Minister Bill Blair. "We want to make sure that the United States fully understands how we are changing the law and the reasoning behind it," O'Brien told HuffPost in an email. U.S. officials say it's business as usual at the border when it comes to inspections after pot is legalized, O'Brien said, adding that authorities have indicated they might pull a traveller aside for further questioning if they're given "reason to be suspicious." "We want to identify and mitigate, as much as possible, any concerns regarding border enforcement," O'Brien said. The government says on its website that Canadians could be denied entry to countries where pot is illegal — like the U.S. — if they have an "involvement in the legal cannabis industry in Canada" or "previously used cannabis or any substance prohibited by local laws.'" But Saunders, who expects a "tidal wave" of cases at the border after Oct. 17, wants to see government officials make it clear to Canadians that they could also face a lifetime ban from entering, one that requires a waiver that costs a lot of money and a lot of time. "They need to be more firm and try to get some kind of guidance [from the U.S.] They need to warn Canadians that there's possible lifetime implications if you admit to an American border officer that you've used marijuana," he said.